Economic Times talked to us a few days ago about our work in online assessment and we are proud to be seen in ET. Here is the full coverage of news. Getting the right candidate during recruitment is not easy for companies, what with the paucity of talent in the country and the high costs associated in unearthing it. 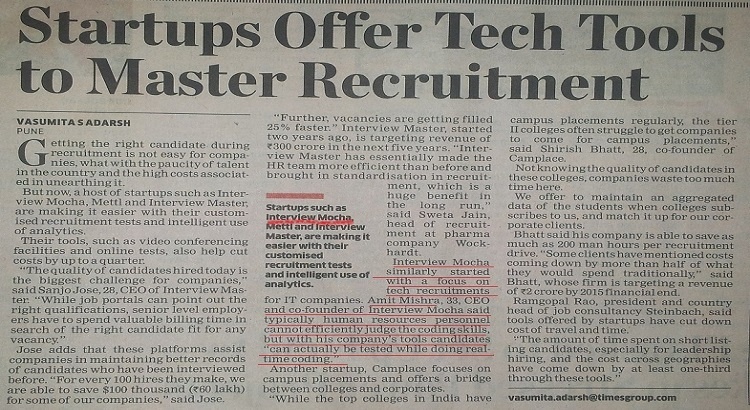 But now, a host of startups such as Interview Mocha, Mettl and Interview Master, are making it easier with their customized recruitment tests and intelligent use of analytics. Their tools, such as video conferencing facilities and online tests, also help cut costs by up to a quarter. Amit Mishra, 33, CEO and co-founder of Interview Mocha said typically human resources personnel cannot efficiently judge the coding skills, but with his company's tools candidates "can actually be tested while doing real-time coding." 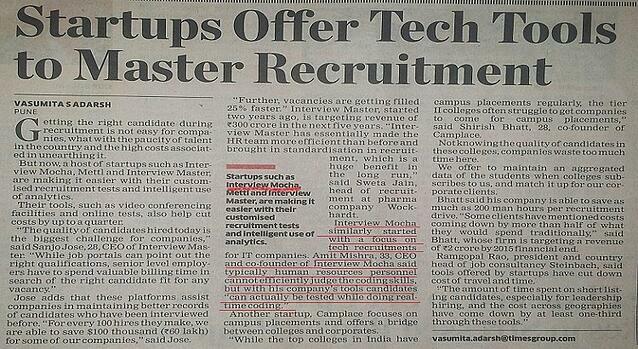 "Not knowing the quality of candidates in these colleges, companies waste too much time here. We offer to maintain an aggregated data of the students when colleges subscribes to us, and match it up for our corporate clients. Bhatt said his company is able to save as much as 200 man hours per recruitment drive. "Some clients have mentioned costs coming down by more than half of what they would spend traditionally," said Bhatt, whose firm is targeting a revenue of Rs 2 crore by 2015 financial end. Ramgopal Rao, president and country head of job consultancy Steinbach, said tools offered by startups have cut down the cost of travel and time. "The amount of time spent on short listing candidates, especially in leadership hiring, and the cost across geographies have come down by at least one-third through these tools." To read full news click here.